Mary’s Pence invited The Kitchen Table, a fall 2015 grantee, to lead a workshop at the Call to Action conference and share the success of their social enterprise. “We made a trip of a lifetime,” says Stephanie Renee Booker-Wynn of The Kitchen Table about her trip to present at Call to Action, an annual faith-based conference focused on the issues of inclusivity and anti-oppression. Stephanie, her friends and co-workers, Danette Brown, Bertha Wherry, and Angie O’Gorman, first met at a support group at Epiphany Church in St. Louis. They talked about wanting to overcome obstacles like poverty and homelessness and stumbling upon barriers to dignified work. Today, they run a workplace they created for themselves. 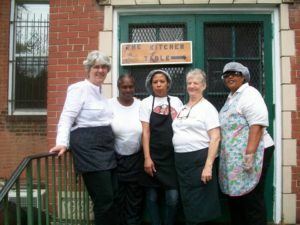 The women of The Kitchen Table prepare a home-made meal for their community every Thursday, manage catering orders, and maintain a garden. Stephanie and her colleagues traveled from St. Louis, MO, to Albuquerque, NM, for the three-day event in November. After Call to Action, Stephanie wrote this reflection. The women of The Kitchen Table welcome you to lunch! It was a long time that we prepared for this city with all of our life woes, skills & concerns, we finally made the trip of a lifetime. Traveling was long and fun, many sites to see and a lot of time to stare into nature and Native life, Spanish and American. A Native Indian Culture Museum that had many memoirs of family, traditions, praise and spiritual dance, pottery, art, education, meals, music, farming, rumbling, and peace. We broke bread together, slept, worked and prepared for a knowledgeable conference about all people, and women had a big voice. The Kitchen Table was able to speak about women’s empowerment and a woman’s enterprise. A group of women who own their own restaurant and support each other as a woman’s support group that is a family of women who pray together and discuss everything. We very much appreciated that Mary Pence (Katherine W.) invited us and that we were grantees that had very unique stories also. We had a great time and we had a chance to tell everyone about our business – cooking homemade meals and preparing them for our customers on Thursdays (11:30 am – 1:00 pm) 2911 McNair, St. Louis, Mo. 63118. We cook all kinds of food i.e… Ms. Stevie Lasagna, Mary Alfredo Pasta and Ms. Stevie Red Sauce, Hot braised chicken and Fried, Honey Mustard Chicken, Veggie Burgers, Chicken Soup, Pea Soup. 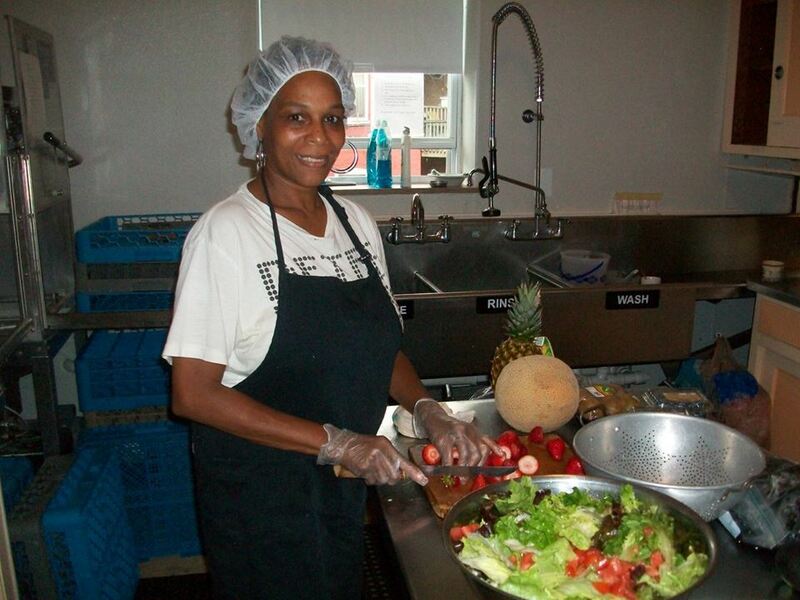 Quesadillas, Salads, Cheesecakes, Peach Cobbler, Lemon Pie, Fruit Bowls and Salads, Homemade Bread, Moussaka. The conference was very informative on many issues of today and the church, politics, women’s rights and equality, religion. We really enjoyed the conference and had a chance to meet a lot of people that told their stories about life, careers, family, and life issues and history of the city, New Mexico and Native American lives. There was a Latino group that discussed deep issues of politics for all people no matter whom they were. Stephanie, Danette, Bertha, and Angie talk about their growth from a support group at Epiphany Church to a social enterprise. Angie, who helped organize the group, views the collective as an alternative to the mainstream economy that often funnels workers into jobs that dehumanize them. “We came into our own power. As we see ourselves in the light of our skills rather than our limits, we’re organized so that skills are to be shared and limits get less and less in the way. …In an ordinary employment situation, people are judged by what they cannot do, rather than what they can do. We wanted to be an alternative to that,” Angie explained. The Kitchen Table is about a grassroots approach to ownership of business and business management, and economics being kept human.